For those following, Something to FEAR has been on a streak lately, taking Rick through the new challenges of being not just a leader or guy helping them survive but instead as a visionary as well. Given all the death and trauma they’ve seen it takes more than just a guy good with a pistol to get things done and this time the group is relying on him not only to help keep them safe but to give them a place to really setup at. Issue 99 paints the image we saw Rick talk about, settling in and forming bonds, a life and looking at a larger picture of something more in this world than just endless zombies across the land. Characters like Glenn reveal huge changes coming not only to the story but their own lives and each hit that comes in chips away at the foundation that we once knew for the group. Characters falling in love was a thing of the moment before, now it’s something they feel grounded in with a community at their fingertips, I doubt TWD team has such hope and unicorns planned for their fate though but for a moment you see everyone taking up a change of pace. Where we go to issue 100, well it’s a bit of a given to say that Negan’s forces are mad at the recent stonewalling they’ve gotten to their efforts to breach the Hilltop and it’s about time for the payback to hit. The current issue sets up a huge pitfall for the group and it might send Rick spiraling out of control given his recent bonding as part of this community. Time will tell but it’s certainly looking like a bloodbath is coming and the happy days of sunshine and skull smashing are about to come to an abrupt stop. Lets just hope that Rick and the others can secure enough weapons and ammo for the storm given their supply issues could put them on the run if they’re caught short. 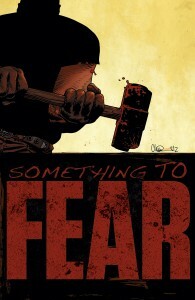 It was fun riding out the Something to FEAR story to this point although I did get derailed from the reality that this is The Walking Dead and 100 is likely to take a sledgehammer to everything we’ve seen built up over the past few issues. Also for those wondering, the art team continues to hum along with great expressions, gestures and characters through the book, the consistency seems to rarely shift in this series which is always a pleasure.